High-level policymakers and leaders need reliable data in order to make informed decisions that impact schools. In an effort to break down silos that exist in education data, the Bush Institute at the George W. Bush Presidential Center today released an interactive online tool that combines education data from multiple sources into one place. State of Our Cities offers comparable data on more than 100 cities in the United States. Users can compare data across categories like student demographics, academic outcomes, district trends and school finances. In addition, users can delve deeper into certain cities to see how they are addressing challenges and ensuring education quality. State of Our Cities features data from 114 cities from all states except for Hawaii, which has a statewide school district. The platform will be routinely updated, as part of the Bush Institute's Education Reform initiative to “help ensure all students are on a path to success,” according to the organization. 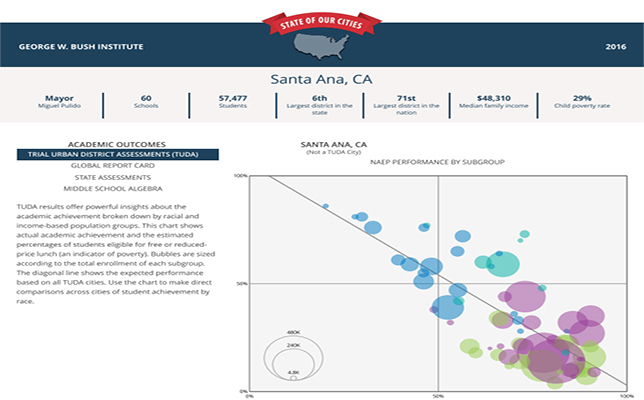 To use the education data, visit the State of Our Cities site.